It was late afternoon on Sunday, July 3 and I had a little time to kill. For those of you unfamiliar with the car sales business, the 4th of July weekend is a big sales weekend. No rest for the weary. No hot dogs, hamburgers, or lounging carelessly around the pool for those in the new car business. It’s all about moving those new vehicles off the lot during the holiday weekend. I just so happened to be driving by one of my favorite Chrysler, Dodge, Jeep, and Ram dealerships, Farrish of Fairfax, VA, and decided to stop and peruse the lot. It was a look but don’t drive day for me. I spent a total of 20 minutes looking at new Grand Cherokees and Ram pickups situated on the outdoor lot when I ventured into the showroom floor. 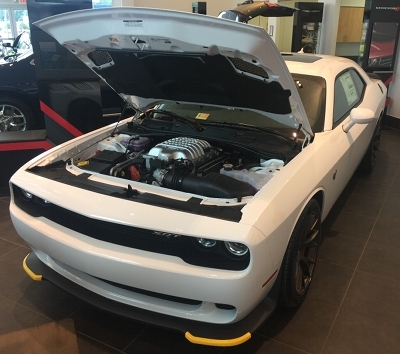 To my surprise there was a white 2016 Dodge Challenger Hellcat with a black interior in all its glory – the centerpiece in the large showroom. It brought back memories of my encountering many rare ultra high-performance new American cars in car dealer showrooms over the many years. These include cars such rarities as the 1989 Pontiac Trans Am (turbo) 20th Anniversary Edition, many special edition Corvettes, Buick Grand Nationals, modern Shelby Mustangs, and many others to numerous to name. 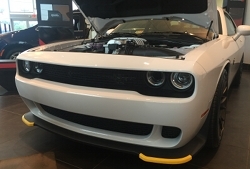 Since their introduction for 2015, the Challenger (SRT) Hellcat and Charger (SRT) Hellcat generally arrive at Dodge dealerships and then with lightning speed move off the lots to their new homes. Even though Dodge has increased production (to 4,000 units) for the 2016 Hellcats, finding them at a Dodge dealership is still a very rare occurrence. After-all 707 horsepower in great looking and well balanced 2-door or 4-door package for only $60K to $70K, is like finding a high-end automatic Swiss watch for $400. There is no shortage of buyers. The white Hellcat Challenger that I stumbled across had a sticker price of $68K. All Challenger Hellcats come loaded with more options than you can shake a stick at, including leather seats and a navigation/entertainment system. The only options on this Hellcat were a power sunroof ($1,995) and 20 x 9.5-inch brass monkey wheels ($995). Pumping up the sticker an extra $1,700 was the (federal) gas guzzler tax. 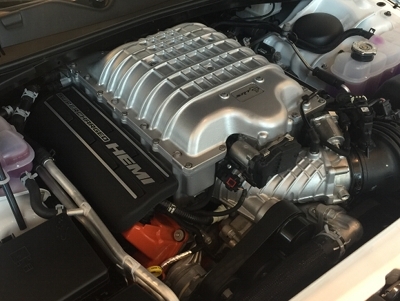 This Challenger Hellcat was equipped with the TREMEC 6-speed manual. Most Challenger Hellcats are equipped with the optional 8-speed automatic transmission (the Charger Hellcat is only equipped with the 8-speed automatic). For me the only way to fly is with the manual transmission. The automatic with its precise computer controlled shifting may be the slightly quicker choice down the 1/4 mile but there’s something special about working through the gears during full-throttle acceleration. It’s like riding a bike through a mountain overpass versus riding a stationary bike while watching TV. Don’t get me wrong the automatic transmission equipped Hellcat is a blast to drive, but the chills down the spine and rush of endorphins is much greater with the 6-speed. The super short throws and precise crisp shifts have you convinced you are in control of this 707 horsepower beast. In the old days a mega horsepower muscle car with a manual transmission had a rock hard (mechanical) clutch, not the case with the Challenger Hellcat, its hydraulic clutch is smooth as glass with no dead spots. Believe it or not, in urban and suburban stop-and-go driving the clutch and transmission are so easy to operate. How the times have changed. Out of the current stock of remaining pony cars (the Chevrolet Camaro, Dodge Challenger, and Ford Mustang), the Challenger is by far the largest in size and most muscle car like in appearance. If this car could speak words it would be “don’t tread on me”. It’s a car that’s easy to use on a daily basis since it has a civilized ride, provides plenty of interior room for both front and rear seat passengers, and possesses a massive trunk that could swallow up Eva Gabor’s entire luggage collection. Dodge was smart in only providing a mild update to the Challenger’s exterior in 2015, the car still brings a smile to my face the same way it did when I saw the pre-production Challenger concept car at a Dodge press event almost a decade ago. The Challenger is a modern icon. 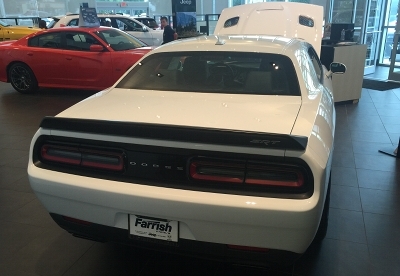 Just like other 2016 Challenger models the Hellcat version provides many extra visual muscle car niceties such as the racing style fuel filler door. The Hellcat has a standard deck lid spoiler and an aggressive front chin spoiler. However the surprise visual delight is the engine itself. Raise the hood and the supercharged 6.2 liter V8 glistens like a piece of art – it’s as beautiful as the 1967-1969 Chevrolet Corvette’s L89 427 CID V8. Unlike most performance engines today which are mostly hidden by black plastic shrouding, the HEMI is old school in the way it flaunts its looks. The silver supercharger and the HEMI Orange painted engine block (painted in the same hue as the original 426 HEMI V8 block) harken back to an era when an engine’s looks were just as important as a car’s exterior lines. Fortunately (for my finances) my stay in the dealership showroom was very brief. Be forewarned, the enticing allure of the Challenger Hellcat takes hold very quickly. The pull in fact is so strong, the thought of an impulse purchase of a $68K car no longer congers up feelings of fear or anxiety. Even the thought of 5 years of monthly payments that could choke a horse seem to have no effect of lessening the intensity of this pull. Truth be known, this kind of big financial purchase is a small price to pay to own the fastest muscle car ever produced. Who would have thought it possible that a square jawed styled rear-wheel drive V8 powered muscle car with round headlamps would ever be produced again? Not to mention one with 707 horsepower and a 201 mph top speed. Golly gee Wally, it doesn’t get any better than that! The party may be over a few years from now. The EPA’s CAFE ratings continue to rise each year where they will eventually reach the 54.5 mpg mark in 2025. A milestone that not even the fuel sipping slow as molasses Toyota Prius can currently meet. It’s a safe bet the Hellcat will be gone in a few model years (I hope and pray I am wrong). Needless to say I am going to have some sleepless nights tossing and turning (trying to get the thought out my mind that a brand new 6-speed Challenger Hellcat is a few miles away awaiting to be purchased). My plan is simple to keep those thoughts at bay, until the car is bought by some very lucky sap. If I am successful my finances will be sound but my heart will be broken. Such is the dilemma of the common man. « 1970 Chevrolet Camaro Z28 – the Best Z28 Ever Made?